PlayStation Store Update – Trials Fusion, FF XIV:ARR, No Heroes Allowed: No Puzzles Either! All of the PlayStation platforms get some love this week with several new releases for both platforms. Conception II: Children of the Seven Stars, No Heroes Allowed: No Puzzles Either!, Dead Nation, Ethan: Meteor Hunter are all now available to download for the PS Vita. The PS4 also gets several releases, including Final Fantasy XIV: A Realm Reborn, Trials Fusion, Pure Chess and That Trivia Game. PS3 owners can pick up the much delayed Teenage Mutant Ninja Turtles: Out of the Shadows, Cartoon Network Punch Time Explosion Xl and 2014 FIFA World Cup Brazil. 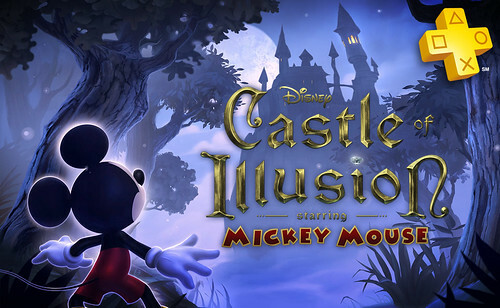 Castle of Illusion Starring Mickey Mouse for the PS3 is the free PS+ game for this week. Bonus: Purchase The Amazing Spider-Man 2 from PlayStation Store and receive the electrifying Electro-Proof Suit for free! The Amazing Spider-Man 2 takes place outside the events of the 2nd film in a unique story where Spider-Man discovers a larger threat to NYC that has turned the underworld upside down. For the true Final Fantasy fan, this collectors edition contains some exclusive in game items that will truly improve your time in the realm of Eorzea. Backgammon’s back… with a bang! Beloved by millions, played for centuries, backgammon is a two-player strategy game quite unlike any other. The goal is simple: race to get your checkers off the board first, but the deceptively deep rules and rhythm of backgammon has secured it as a favorite among casual and veteran players alike. Whether in single, local or online multiplayer or blasting through the madness of Blitz mode: one taste and you’ll be hooked. Rendered in a gorgeous style – harnessing cutting-edge tech – this vision of backgammon isn’t merely a faithful adaptation of the game it’s a world you want to reach out and touch, a place and atmosphere you want to relax in and soak up as you graduate from pupil to master, or veteran to… show-off. Experience one of the oldest known boardgames on the advanced technology of today. With ultra-realistic HD visuals you can almost reach out and touch the pieces. Pure Chess is a game that can be played by everyone, at any age, but mastered by only a few. The question is… Are you a Grandmaster in the making? Plan your attack in style with the Pure Chess Complete Bundle! Including the full game and all game packs Easter Island, Halloween, Roman, Park, Forest and Battalion. Enjoy all of Pure Chess’ stunning HD visuals – in one incredible package, at a discounted price! Are you a Grandmaster in the making? Play against the computer or up to 3 of your friends in That Trivia Game! Featuring over 1,000 up-to-date questions to test your knowledge of 20 different categories for hours of fun for the whole family! With 24 character combinations and four challenging rounds per game, That Trivia Game is more exciting each time you play! Did you ever wonder what would happen if Humungousaur and Samurai Jack met up in a dark alley? What if Dexter took on Mac and Bloo? The possibilities are endless! If only there was a way to get all your favorite cartoon characters together… Well you don’t have to wait any longer… Get ready for a Punch Time Explosion! Born with a connection to a mysterious entity with incredible powers, Jodie was different. In an adventure spanning 15 years of her life, your actions will determine Jodie’s fate as she faces extraordinary challenges, danger, and heartwrenching loss on a journey to discover the truth of who she is. Beyond: Two Souls promises an emotionally-charged journey unlike any video game before..
For a limited time, purchase Castle of Illusion: Sega Genesis Bundle and receive the original Sega Genesis version of Castle of Illusion (1990) and a Mizrabel dynamic theme for free. This special bundle offer will end on April 29th. Your name is Ethan, hit by meteorites giving you special powers: freeze time and use the touch screen or the rear touch pad to manipulate the world to get through the way YOU want. Levels can be solved in multiple ways. With its unique blend of precision platforming and time-stopping physics-based puzzles to race through a gauntlet of ruthless hazards, you may die repeatedly and enjoy it! Save dastardly villain Badman from an army of brave heroes in this free-to-play puzzler. As the all-powerful God of Destruction, you must quickly move falling tiles to match three or more identical icons – which will then summon a pack of deadly monsters hungry for juicy hero flesh. For each second that passes, the heroes take one step closer to finding your master. Can you take them out in time? Hyper Crazy Climber is a sequel to the classic Nichibutsu developed arcade game Crazy Climber. Released in Japan in 1996, the game stars a daredevil who must make his way to the very top of arduous buildings such as a medieval clock tower, beanstalk and haunted skyscraper, all while overcoming zany obstacles along the way. Like the title suggests, it’s truly a crazy climb to the top! Go behind the scenes of the new season of Crackle’s thrilling original series, “Chosen”, starring Chad Michael Murray and Rose McGowan. “Chosen: All Access” reveals how Crackle’s critically acclaimed series creates spectacular car chases and epic shootouts that bring the excitement and danger of the third season to a whole new level. Watch an exclusive early preview of “Chosen: All Access” only on Crackle on PlayStation 3, PlayStation 4 and PlayStation Vita starting today. Check out the show here. It’s the start of a new anime season, and we launched a ton of great new anime titles entering our service, including the eagerly-awaited season 2 of “Fariy Tail”, as well as the juggernaut Shounen Jump favorite, “JoJo’s Bizarre Adventure”! And let’s not forget new titles like “Black Bullet”, based on the popular light novel of the same name, and Nanana’s Buried Treasure, from the same studio that produced hits like Sword Art Online! Where everyone wants to be an icon. From the offbeat mind of Mike Judge comes Silicon Valley, a new HBO comedy that takes viewers inside the world of tech start-ups – and the socially awkward underdogs who try to navigate its lucrative potential. Catch new episodes every Sunday night at 10pm EST. Watch the trailer for season 1 here. This week on Redbox Instant. Available for Rent/Buy: Kevin Hart and Ice Cube star in Ride Along. Get the first crack at seeing the animated hit Nut Job and be sure to check out our 10 minute FREE previews for both! For our subscribers, new premieres to the catalog are GI Joe Retaliation and Tyler Perry presents Peeples. Also being added to the subscription catalog are classics like The Matrix Trilogy, Blade & The Devil’s Advocate. Check out other titles here. With all of the excitement of WrestleMania 30 behind us, and the shocking news of the Ultimate Warrior’s passing last week, WWE Network is going to have some great content available to celebrate the life of one of the most iconic WWE Superstars ever. Relive WrestleMania 6, which pitted the Immortal Hulk Hogan against the Ultimate Warrior for the WWE and Intercontinental Championships and don’t miss the Ultimate Warrior special, Live on WWE Network this Wednesday, April 16 at 8pm ET. If you don’t have the WWE Network yet, sign-up here and get 24/7 streaming content with both scheduled programming and an on-demand library that you can access everywhere for only $9.99 a month (with a six-month commitment). No Heroes Allowed! No Puzzles Either!